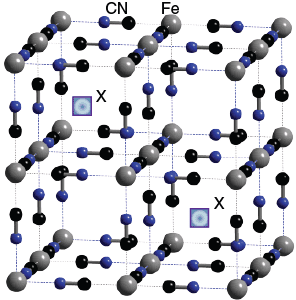 The Fe(III) and Fe (II) are linked in a cubic shape by CN- ions. The sites labelled 'X' in the diagram highlight regions that cations or water may occupy. The low spin Fe(II) ions are linked in an octahedron to 6 carbons, whilst the high spin Fe(III) ions are linked in an octahedron to 6 nitrogens.